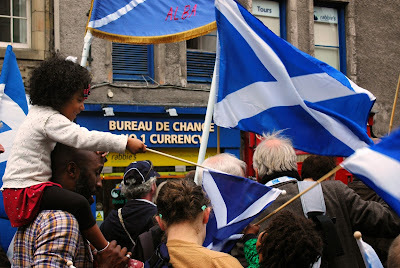 Or, the United Colours of Independence go to Calton Hill. 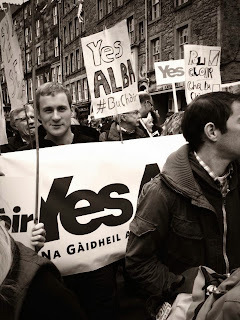 Do we only do marches like this because Better Together can't? Could you really see rank and file nurses and postal workers marching behind Alastair Darling and a cameo walk-on by David Cameron? All headed by an Orange flute band in full song and security provided by the EDL? There may have been many of the already converted among the twenty to thirty thousand who marched from the High St to Cnoc a' Challtainn yesterday but a demonstration it most certainly was. 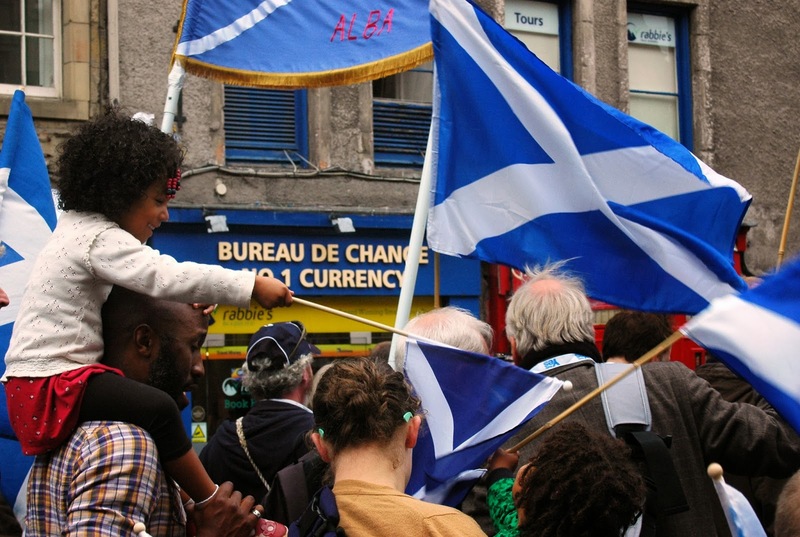 A demonstration of what the 'no' campaign have yet to manage - people of all colours and from many nationalities marched for a positive and progressive future. German and French was heard alongside Gaelic. 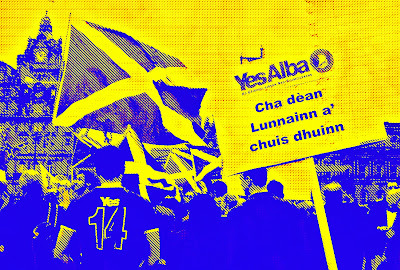 Bairns and bodaich gripped their Saltires. And those who were once counted as the 'Labour vote' giving passionate and pertinent speeches for old-school British values like the Welfare State - now threatened more by a right-wing London hell-bent on privatisation than by Scottish 'separation' which seeks to keep them intact. Then, we have a son of a Falkirk scheme. Why has Alan Bisset gone so far off the Labour message? Let's get out there and do it. Bitter Together can't touch us.